A long while ago, I bought a bottle of Jefferson’s Reserve Very Old Straight Bourbon. I think it may have been for one of the Wookie’s Derby days, but in the haze of the many, many bottles purchased since then (some for me, some for Pappy, some for under the house), I can’t quite remember. 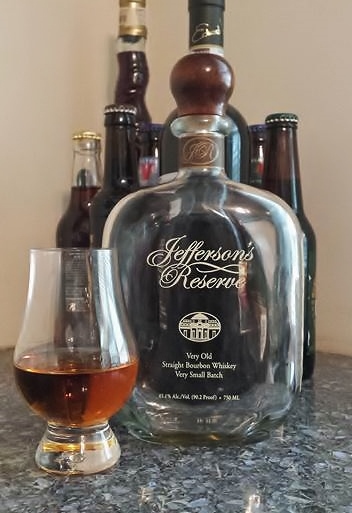 In any event, I had a gorgeous bottle of Jefferson’s Reserve and as it moved to its final reward ( and ultimately, my Recycle Bank points), I thought I would take the time to finally review it. Castle Brands is one of the few publicly traded global alcohol companies. They are a developer and international marketer of premium and super premium beverage alcohol brands which are marketed and sold worldwide. Castle Brands was established as Great Spirits, LLC in 1998 through the contribution of the Andrews family-owned Knappogue Castle Irish Whiskey. In 2003, the Great Spirits company was merged into the newly formed Castle Brands and a rapid number of acquisitions added Jefferson’s Bourbon, Boru Vodka (a premium Irish Vodka and named after a King who usurped the powers of those kinsmen of which I claim descent. All hail Niall Noígíallach! ), Clontarf Irish Whiskey (another reference to Brian Boru), and Brady’s Irish Cream Liqueur as well as the exclusive distribution rights to Gosling’s rums and Pallini Limoncello. The brands were added not so much for mass but for quality as all of the brands have received numerous awards in international competition. Jefferson’s Bourbon was founded in 1997 by Trey Zoeller and his father, Chet. Trey selected the Jefferson brand to provide an almost instant cache within the industry. His company was acquired by Castle Brands around 2005. Jefferson’s Bourbon does not distill any product. Rather, the company aged bourbon from other producers and then blends the various barrels to produce a consistent product. Our flagship bourbon is where we define the Jefferson’s taste: big and bold with hints of spice, toffee and leather. The Reserve is the perfect marriage of four different recipes of bourbon, one of which is an elder statesman. The result is bourbon that, like Thomas Jefferson, is sophisticated, complex and unforgettable. Appearance: Clover honey with a lot of legs. Aroma: Sweet with hints of vanilla and butterscotch with a bit of a rye note and a little vapor. Taste: A little thin with some caramel sugar and then a big peppery bite followed by some heat and a mild, somewhat short, rye finish. I was never a big fan of Bourbon. I have The ROK to thank for dragging me ( okay, maybe I went willingly) to explore the finer libations from KY and elsewhere. I have to say that I really enjoyed this one. So, I am little sad to see it go. On the other hand, I’m down a good bottle of bourbon and now I have space to find a suitable replacement. Suggestions are welcome but I am leaning toward another, pretty, pretty bottle of Jefferson’s Reserve. Thanks. After Miracle Max’s generous bottle share, I think maybe a bottle of Ocean or Groth Reserve. I recommend and am a big fan of the Groth Reserve. It is my favorite in the Jefferson lineup.